Image from the website of Will Potter, an independent journalist who specializes in ag-gag investigations. It was only last month that Kickstarter officially announced it would add journalism as a formal crowdfunding category, but an enterprising journalist last week decided to combine crowdfunding with another cutting-edge journalism tool: drones. It took just five days for Will Potter, a TED fellow and independent journalist based in Washington D.C., to surpass his $30,000 goal to fund a drone journalism project. 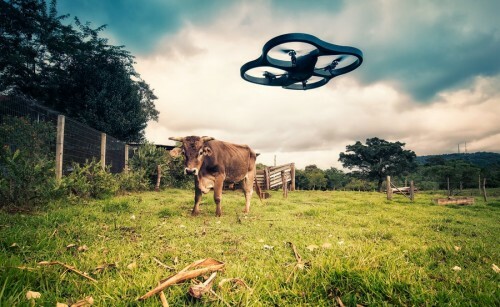 What’s particularly notable about this project, besides the novel funding model, is that Potter is hoping to shed light on factory farming practices with his drones. As early as 2012, activists have been using drones to uncover animal rights abuses. The SHARK (SHowing Animals Respect and Kindness) organization, which used drones to document the arguably inhumane tradition of the “pigeon shoot,” once had a drone shot down by hunters. However, the organization was successful in obtaining photos and videos of hunters that helped raise awareness for its cause. Potter could face more than well-armed ranchers in his pursuit to document the plight of animals on factory farms. On his Kickstarter page, he notes that states have adopted “ag-gag” laws that prevent reporters from shedding light on farm conditions. Other journalists have used satellite photos to reveal pollution on these farms, but Potter wants to use his drones to get much closer to his subjects. Having surpassed his funding goal, Potter wrote that he intends to expand the number of states he’ll visit, and purchase higher-quality drones and cameras.